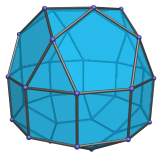 The pentagonal cupola is one of the Johnson solids. It is bounded by 1 pentagon, 5 equilateral triangles, 5 squares, and 1 decagon. It is the 5th polyhedron in Norman Johnson's list, and bears the label J5. 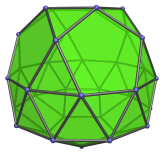 A pentagonal cupola of edge length 2 has height √((10−2√5)/5), or approximately 1.05146, the same as the height of the pentagonal pyramid (J2). It is therefore a rather shallow shape, barely over half of its edge length. 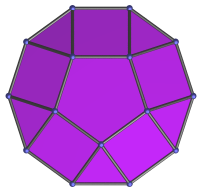 In 4D, this fact causes the segmentochoron decagonal_prism||pentagon, which has two pentagonal cupola cells, to be even shallower. This in turn has the consequence that a very large number of 10,n-duoprisms, up to n=20, can be augmented with this segmentochoron and remain convex, thus producing a large number of CRF augmented duoprisms. A pentagonal cupola can be elongated by attaching a decagonal prism, forming an elongated pentagonal cupola (J20), or by attaching a decagonal antiprism, forming a gyroelongated pentagonal cupola (J24). Pasting two pentagonal cupolae together in ortho orientation produces the pentagonal orthobicupola (J30). Doing so in gyro orientation produces the pentagonal gyrobicupola (J31). Inserting a decagonal prism between the two cupolae produces, respectively, the elongated pentagonal orthobicupola (J38) and the elongated pentagonal gyrobicupola (J39). Inserting a decagonal antiprism between the two cupolae produces instead the gyroelongated pentagonal bicupola (J46). Augmenting a pentagonal rotunda with a pentagonal cupola produces a pentagonal orthocupolarotunda (J32) or a pentagonal gyrocupolarotunda (J33), depending on its orientation with respect to the rotunda. Inserting a decagonal prism between the rotunda and cupola produces the elongated pentagonal orthocupolarotunda (J40) and the elongated pentagonal gyrocupolarotunda (J41), respectively. Inserting a decagonal antiprism instead produces the gyroelongated pentagonal cupolarotunda (J47). 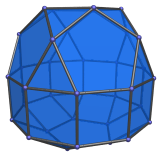 The triaugmented truncated dodecahedron (J71). Parallel projection centered on pentagon. Projection parallel to a pair of opposite decagon edges. Projection parallel to a pair of opposite decagon vertices. These coordinates produce a pentagonal cupola of edge length 2, resting on the XY plane and having its axis of symmetry aligned to the Z axis. These coordinates are algebraically nicer, in that they involve only simple expressions in terms of the Golden Ratio φ; however, the pentagonal cupola thus obtained is in an orientation unaligned with the coordinate axes. Last updated 12 Mar 2019.